This is one of the amazing brothers grimm fairy tales for the children. A long, long time ago, there lived a king and his beloved daughter. The princess was very clever and very beautiful. “Oh! My darling, what do you want to do when you grow up?” asked the king. The princess replied, “I want to marry a handsome prince.” The princess grew up and was ready to get married. Many princes around the world proposed her. But the princess was very proud. “Oh, princess! Please accept my proposal,” said the prince. Read more about, King Thrushbeard. Many princes around the world proposed her. But the princess was very proud. “Oh, princess! Please accept my proposal,” said the prince. The princess in return, said,”Oh, my! You’re from a small country! How can you propose to me? Go back to your country!” The princess rejected all their proposals. She had her reasons. 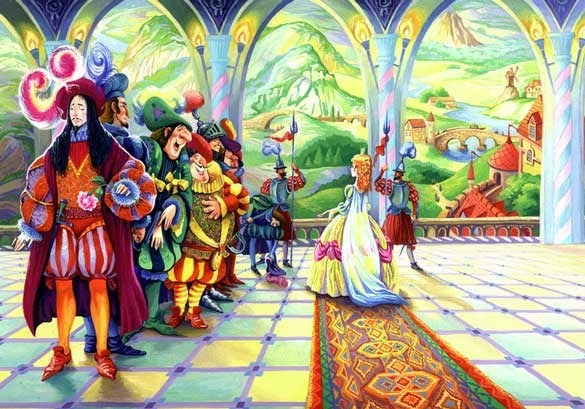 One day, the king invited all the people who wanted to propose to the princess. He held a big party. All the young men stood in the line to propose to the princess. The princess talked to them one by one. The princess made fun of their looks. She especially made fun of a king who was standing in the front. His chin was little crooked. “Oh! Your chin looks like a thrush beard!” laughed the princess. From then, he was called King Thrushbeard. Her father was very angry with the princess’s rude attitude, but he stayed at the party. Then he called the princess and said, “How can you treat people like that?” The princess said, “Why? They all are ugly and they aren’t a good match for me!” The King was really very angry and decided that her daughter would marry the first beggar who would come through the door the next morning. You may also like, Tom Thumb Story. The next morning, a traveling musician came to the window. The musician began to sing. The king heard the singing. The musician was led to where the King and the princess were and he began to sing in front of them. After he sang, he started to speak, “Please give me some money if you liked my song!” The king liked his song very much so he decided to give his daughter for his wife. The princess was very surprised. “Oh! How could you,” she cried. “I swore that you’re going to get married to the first beggar who comes here, so I’m going to keep my word!” Even though the princess tried to talk, it was no use. The King called the priest and held the wedding for the princess and the musician. The King gave her nothing and made her leave the palace. The princess cried and left the palace with her husband. She asked the musician when she reached a big forest, “Whose forest is this?” “This is King Thrushbeard’s forest!” replied her husband. Now, they were passing by a prairie. 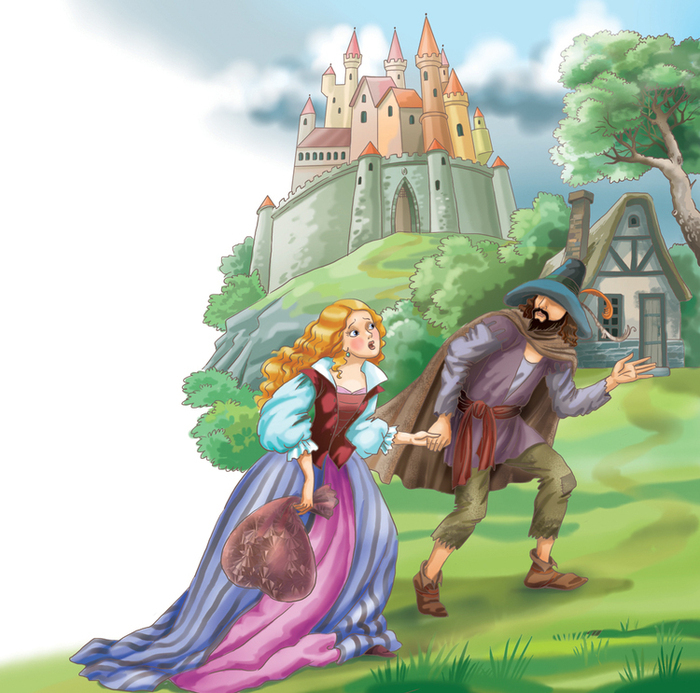 The princess asked him again, “Whose prairie is this?” The beggar replied, “This is King Thrushbeard’s prairie!”. The princess thought to herself, “It would be mine only if I’d chosen him as my husband!” The musician and the princess walked and walked until they reached a small hut. “Oh dear! This hut is so small and dirty! Whose hut is this?” asked the princess. The musician replied, “It’s our house!” The princess had to bend her waist to get in the house. The princess had to bend her waist to get in the house. It was very shabby from inside. There was only a closet, a table, and a few bowls. The princess was surprised to see that there were no servants. The musician told her to do the household work all by herself. The princess had never done any of that before, but she was able to eat dinner with the musician’s help. Also read, The Twelve Dancing Princesses. Next day, the musician talked to the princess, “Dear, we can’t live with only one man earning money. You should make baskets!” The musician brought some willow tree branches. Her soft hands were cut and hurt because of the willow tree branches. “It’s not working! I think it’s better to spin thread,” her husband said. So, the princess tried to spin thread but she cut her finger on a strand and bled. “This isn’t working too well! Why don’t you sell bowls?” he said. The princess was ashamed to do so but she had no other choice. “Please buy these bowls.” People couldn’t hear the princess’s voice because it was too slow, but she sold a lot. People bought the bowls because the princess was very beautiful. Everyone paid the full price and some people just gave her money without taking the bowls. The princess was very happy. Then, one day, the princess brought many bowls to the market. She put the bowls on the ground and was ready to sell the bowls. Suddenly, a drunken soldier on a horse bumped into the bowls. All of her bowls broke into pieces. There was nothing left. The princess began to cry. The princess came back home and told her husband what had happened. “Why did you put the bowls on the ground,” her husband shouted. The princess just cried. “Stop crying! They are looking for a maid to work at the kitchen in the palace. Go there and work,” her husband told her. The princess worked at the kitchen. Then, one day, the king was getting married, so the princess went to the hall to watch the wedding. There were many people in gorgeous outfits. “Ah, there are so many good looking people here! I would be happy in that kind of dress if it wasn’t for my pride,” the princess regretted what she had done. The servants served the food in front of the princess. They gave the princess some food. She wanted to take it home so she put it in the pot. Then suddenly, the king showed up. The King looked wonderful with his silk outfit and gold necklace. The king saw the princess and said, “Oh, beautiful lady! Why are you standing here? Dance with me!” “No, I’m just a girl working in the kitchen,” the princess said. The princess was surprised when she looked at the king. He was King Thrushbeard, whom she had made fun of. King Thrushbeard took her inside the hall. Then, she dropped the pot and it broke. The princess picked up the food. All the people laughed at the princess. The princess was so embarrassed and ran to the door. But, King Thrushbeard caught her on the stairs. “Look at me closely! Don’t you know who I am?” The princess looked at King Thrushbeard closely. Then, she was very surprised. “That’s right! I’m the musician who lived in the hut with you. I pretended to be someone else. I’m the soldier who broke the bowls. This is all because I wanted to help you to get rid of your pride!” said King Thrushbeard. The princess began to cry and said, “I was really mean. I don’t deserve to be your wife!” King Thrushbeard was happy to see her wife realizing her mistakes. So that day became King Thrushbeard and the princess’s wedding day. The princess’s father attended the wedding. Then, King Thrushbeard and the princess lived happily ever after. Read, The Goose Girl!